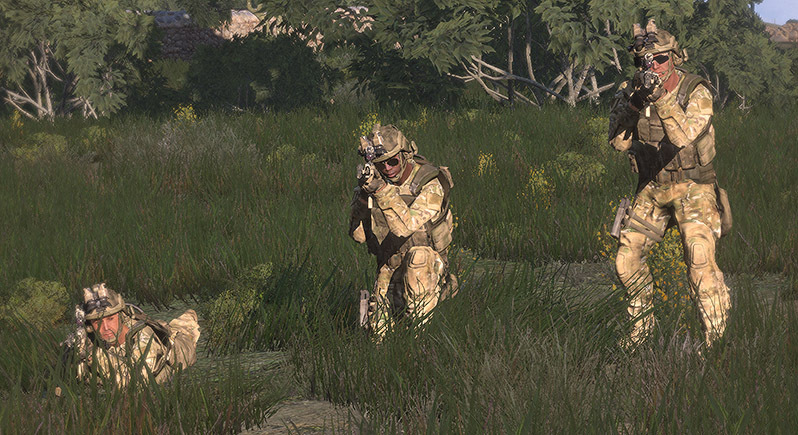 This piece is a companion to my Arma3 Alpha Movement & Shooting overview. Please note that this is a description based on the initial Alpha release – expect to see the Arma3 controls evolve to some extent as it moves closer to release. I will attempt to update this to reflect those changes going forward, and keep a note of when and what was changed. Please feel free to share this and the companion video around to anyone who might have thought that Arma2 was a clunky game to play – because it most certainly was, and Arma3 is very different in that regard. 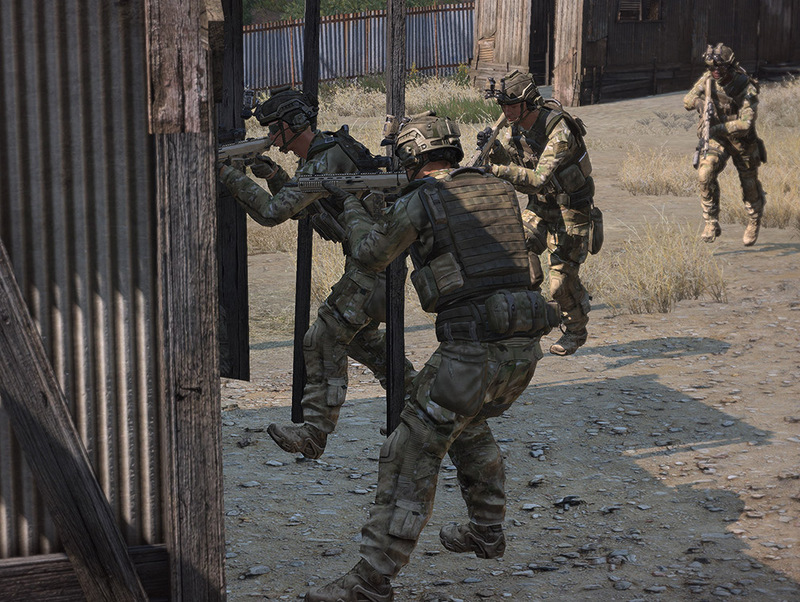 Bohemia has put a lot of effort into improving the movement mechanics, animation system, and mouse control of Arma3, and I think anyone who wasn’t happy with it before will be pleased to see these long-desired changes. Here I’ll cover my personal preferences regarding control bindings. These are not the defaults, and I’m not saying they’re perfect, but they’re what I use, and I really like this setup. Try it and see, or just give the defaults a go – your choice. There are a few things that everyone should have standardized. For one, if you’re coming from an Arma or DayZ background, you are probably familiar with the concept of freeaim. This is where your weapon moves independent of the screen until it reaches an invisible boundary, at which point your view turns with it. The short version is that freeaim in Arma3 is one of the worst control decisions you can possibly make. It’s off by default – leave it there. Freeaim is a feature for those who are nostalgic about a time when the ArmA controls were just plain bad – leave it there, it’s the past. Let’s move on. Mouse acceleration – turn it off, unless you’re positive that you want it. If in doubt, just keep it off. Smoothing should be turned off as well. For even more responsive mouse controls, turn “VSync” off in the video options. Next, let’s look at the actual control binds. I use F and V for my stance up and stance down respectively. F is bound to a control called ‘Up’ – nice and cryptic. What this does is toggle between standing and crouched. You can basically think of it like a ‘toggle crouch’ bind that you’d see in other games. V is bound to a control called ‘Go prone’. Again, this is a kind of awkward name for it – it’s more like ‘toggle prone’. If you’re standing or crouched, and you press ‘toggle prone’, you’ll immediately go prone. Simple enough, right? The only thing to remember is that if you’re prone and you press prone again, you’ll stand up. If you’re prone and you press ‘up’, you’ll go to a crouched state. Note that if you use the F and V binds I use, you’ll want to ensure that ‘Get out’ and ‘Eject’ are changed, as well as any other potentially conflicting binds. I use Ctrl-E, pressed twice, to toggle eject. This is a keybind you will not accidentally press. I don’t have ‘get out’ bound – and I don’t feel that I need it. Your mileage may vary. Ok, so, those are the basic stances. What about stance adjust? (called Adjust in the menus). You need a key that’s easily accessible for your stance adjustment – this is the fine-tuning you can do; we’ll talk more about it later, but for now just consider what key you’d like to use for it. I recommend Tab, CAPSLOCK, left control, or left alt. Personally, I use left alt. It needs to be a key you can comfortably press while also accessing your forward and back keys – W and S by default. You also want to make sure you’re using a good walk/run method. I recommend binding Walk or run temporary to left shift. When you hold this, you’ll walk. There’s also a toggle for it, called walk or run toggle, but I personally don’t use that. I believe it’s bound to double-tap left shift – this can lead to accidentally toggling it, so I just leave it off. There’s a bind for W+S and S+W to toggle between walk and jog – unbind it; there’s a better method to use. Next we have tactical pace – this is a new movement mode in which instead of jogging, you move slower but with your weapon ready. You could think of this like a urban combat movement speed. I recommend binding this to something intuitive – I use Left Shift + Left Alt. If you use that bind, make sure that you bind it both ways – Left Shift + Left Alt, as well as Left Alt + Left Shift – this means that it won’t matter which key you press first. My rationale for this is that Left Alt acts as a “tactical stance” adjuster, while left shift is my speed modifier. Tactical + speed == tactical pace. After that, here’s a cool trick I learned from Karel Moricky of BIS. I’ve been using this keybind for months now in Arma2 and I absolutely love it – it’s clever and streamlines things. The trick is to make it so that your ‘Turbo’ bind – which is another weird way of saying your run key – isn’t double-tap W as it is by default, but instead is the combination of your W and S keys. With this, while moving forward, you can simply roll your finger down to press S at the same time as W, instantly transitioning you into the sprinting state. Try it – it takes a little bit to get used to, but once you’ve got it down, it’s a fantastic method. My mantle key – stepping over an obstacle – is W+X. Like the sprinting bind, this is a clever combination that allows you to take a key that doesn’t conflict with the concept (for me, X is my ‘hold breath’ key) and give it a second purpose when combined with a movement key. The default Arma 3 Alpha keybinds map the ‘G’ key, formerly used for accessing your inventory, to ‘throw grenade’. This is extremely dangerous for players who are coming over from an Arma2 background – I strongly recommend rebinding this to a different key, or using 2xG as the key instead. Note that gear is now on ‘I’, for Inventory. With that being said, there are a few things I recommend unbinding to address some potential latency issues with your controls. Make sure that your Q, W, and E keys do not have any double-tap binds on them. Q and E by default are your evasive keys, and they’ll have double-tap binds. Remove those. This will prevent you from accidentally ending up stuck leaning left or right when you don’t want to be. W by default has a double-tap bind for sprint – if you did what I recommended and used W+S for your keys, you don’t need that – remove it. Any key with a double-tap bind on it will have a slight response lag to it, as part of detecting double-taps. Look for double-tap keys like ejecting or leaving vehicles, toggling into different states, etc, and try to remove the ones that you won’t need. Speaking of, the one last thing you should tweak is your mouse. By default, right clicking brings your irons up, and holding right mouse zooms you in. This is problematic – if you keep this bind, your right-mouse zoom will have about a half-second delay before it happens. I don’t know about you, but that bothers me. What I do to get around this, is remove my ironsights from right mouse, and instead use my Z key for them. I’ve been doing this since at least Arma1 and particularly thanks to the very fast zoom that Arma3 has, I couldn’t go back. Try it. If you like it, use it. If you don’t want to move your ironsight key off of right mouse, you could also try changing it so that zoom is on your Z key. That way you’d have an instantly-responsive zoom, while still retaining the right-mouse ironsights. It’s up to you. There are two other binds I do with my mouse that I think are worth considering. I have a Logitech G9X mouse, so you may not have the same functionality – but if you do, it’s worth considering, and if you don’t, it’s worth considering getting a mouse that does. The G9X has a scroll wheel that has side to side functionality. Press left on the mousewheel and you can trigger an event to happen, same with pressing it right. By default these are set to scroll left and right, but you can modify these buttons to do special keystrokes or act as generic buttons or whatever via the Logitech software. Arma3 has a number of weapons with magnified sights. Here we have a HAMR sight on the MX rifle. This is great for plinking people at a distance, but what if you want to get up close and personal? Well, Arma3, like Arrowhead, has multiple sights per weapon where appropriate. That little red dot on the top of the scope – that’s an unmagnified optic intended to be used at closer ranges where the magnification is unnecessary or a hindrance. The problem with this is that you need a bind to switch to it, and you want something pretty accessible. If you’re like me, your other keys – the easy-access ones – are full of other important stuff. I can’t really make room on my keyboard because of that. So instead, I use my G9’s middle mouse scroll right ability to toggle between magnified and non-magnified sights. It’s a very intuitive bind and makes good use of the middle mouse button functionality. Along those lines, I use my left scroll to toggle the infrared laser attachment, or the flashlight attachment. In reality you don’t necessarily want one of those turned on all the time – having it on left scroll allows me to toggle it on when I need it, then quickly toggle it off. You can find this listed as ‘Lights’ in the keybinds. While it’s significant to use this functionality for the IR laser – having many lasers on at once can be confusing – being able to turn your flashlight on and off quickly is even more important. Any idiot can see a flashlight in the dark, they don’t need nightvision like with the lasers. If you need to illuminate, turn on your light, sweep what you need to see quickly, then turn it off and move. This is how you avoid death in the real world when employing tactical lights, and it’s not too much of a surprise that the same principles apply to Arma. So, those are some basic controls to get you sorted out for infantry gameplay. If you’d like to see more on how it all comes together, check out my Arma 3 Movement & Shooting tutorial. Arma3 is a great opportunity to reevaluate keybinds, consolidate them, and integrate new possibilities. The default keybinds aren’t bad, but it’s something worth looking at to see if it works for you. For me, these changes have helped me significantly in my gameplay. I am continuing to evaluate the possibilities with A3, and there are a few things I can anticipate experimenting with in the future as they’re introduced to the Alpha. Best of luck to you in your adventures in Arma3-alpha-land. Dsylexci I have to say these tutorials are superbly laid out and I cannot wait to play tomorrow, I also loved the World Premiere….DAT MUSIK DIS GUWD! I hope A3 will bring us all the joyous memories A2 did. Great guide, may have to do some fine tuning seeing as I don’t have quite as “fancy” a mouse as yours, The differences in this game compared to arma 2 is absolutely breathtaking. One question, is hold breath default bound to RMB, like it was in arma 2? Excellent! Thanks for writing this all out. Very useful, as is all of the content that you produce. Thanks for the tutorial and recommendations. Very useful. Bloody Brilliant Dsxy! love it, Keep up the great work! Great article and videos. I was thinking about how I would rebind my keys and it occured to me that ALT+mousewheel might be nice for stance changes. Would this work well in your oppinion? Yes, I think that’d be great – I’ve asked for that in the past. Maybe we’ll see it? One can hope! So, regarding this particular bind, can i set it like this: Adjust = ‘Left Ctrl’ ; and UP = Mouse Wheel up ; DOWN = Mouse Wheel down ??? In short i want to be able to change stance without having to stop walking, by using the mouse wheel up or down insted of ‘W’ and ‘S’ keys, i couldnt figure how to. Is that possible? Im very confused. It would be even better if it worked by using a key+mouse to adjust stance. That way you could keep moving forward holding “W” but use say… “ALT” and adjust your stance up, down, left or right by simply moving the mouse. Hey Drew, subscribed to your YT. Great stuff. Also watched your real flight vids, very kewl! Can you share your updated a3 settings? Also, if you still play it, can you share the a2 settings you prefer? I’ll update this at a later date re: ironsights and zoom – there’s something I intend to start using in the future, but it’s not possible yet in A3. Instead of waiting for an update in-game, you might consider using a Keypad (Nostromo or Logitech G13) and/or a Gaming Mouse (Logitech G600). Those devices support 1:1 keymaps as well as macros. Where there’s a will there might just be a way my friends. Very helpful advice. Have been trying it out. One question: what is the binding to select for using the unmagnified optic on scoped weapons? I looked at all the options and couldn’t figure it out. Thanks again. It’s called “Toggle Optic” or “Optic Toggle” (I forget which order) in the options, the default bind is Ctrl + Right Click. Hey Dslyecxi, I don’t see ‘Lights’ listed as an option to change in the controls any more. I have the same mouse as you and am trying to get the same keybinds for left and right scroll. It’s under common, not weapons. Just wanted to know how you managed to setup the left and right buttons on the G9X? I dont seem to be able to do it. I’ve tried setting the buttons to ‘genric buttons’ in the logitech app but still no dice with ArmA 3. Wish ARMA3 had analog infantry movement controls, so that one could go from silent creep to walk to tactical pace to jog to sprint seamlessly by using one axis. Strafe being another axis, of course, (same idea) but this one at full and sudden deflection would trigger an evasive to that side, or a step lean (with a modifier key). Coupled with something like Logitech G13 with its thumb joystick and 25 programmable keys, this could provide better immersion and intuitive infantry pace controls which do not require one to hold 2-3 keys at the same time and free up fingers to do other things. In fact, I think this is a perfect set-up right here. Except I’d bet 90% of people don’t have analog controls anywhere on their computer apart from the mouse and possibly a joystick. But yeah, support for something like that would be pretty awesome. Maybe something for modders to think about? Great article and video dslyecxi. Do you think it’s possible for you to upload your config file with keybinds (if there is such a thing in Arma3, i didn’t check)? Could you publish the mapping of your Keyboard in a simple to see picture? Hey Dys, I set up my keybinds with the guidance offered here. I gotta say it is an adjustment from arma 1 and 2, but I like it. Only thing I noticed is for me, when hitting ALT + SHIFT it enters tactical pace no problem, maintaining my same speed, but when I do SHIFT + ALT it also enters tactical pace but slows me to a walk instead. Is this happening for you? Check to see that there’s not a conflicting bind elsewhere. I cant see a conflicting bind besides for the “temporary walk/run” like in this walkthrough. I have found that when I do the shift+alt and it starts me toggled into walking at a tactical pace, simply tapping shift again breaks me out of the walk toggle and returns me to jogging tactical pace, and returns my ability to press shift to temporarily tactical walk, snapping back to jogging tactically when I release. Perhaps post it to their issue tracker? as you use LEFT ALT as the stance modifier key: Is it possible to still use it for look/free look then? Since I use TrackIR, I have no need for the freelook key. dslyecxi, have you gotten used to it from the start or did you took some time to? Another thing, when turning your head left and right, do you find your sense of sight less “reliable”, as your eyes are not aligned with your head. I don’t know if it’s possible to set it up to do the full turn without you having to turn your head that much. I use TrackIR for freelook as well, but combining free look with optics has some cool features in ArmA3. For instance, when sights are up, you can still use look to move the muzzle without turning your entire body. Useful for reducing movement signature when proned with an optic (since your whole body doesn’t move when aiming), and can also be used to maintain movement in a direction while pointing the muzzle and sights slightly off-center. Do you just forgo these features or am I mixing up binds for sometime else? Where can I find a printable keyboard layout diagram for all controls? I have the same mouse and just set it up for sights toggle and lights. Great suggestion (plus the rudder pedals toe brakes for leaning and vehicle throttle), thanks! As to movement speeds, you had me thinking there were five but I think it’s four: Walk, Tactical, Run and Sprint. Unless Jogging is a different one? I realize that you didn’t invent these bizarre configuration terms and assume that Jogging is synonym for Running. I’m not even sure if these are all correct. I’m finding that I can’t Combat Pace Toggle if I’m walking, I need to be Running for it to work. Etc, etc. I have my bindings worked out, so I’m happy. Thanks for the tips. What do you have bound for ‘Vault’? What VoIP keys do you have bound? What do you use for changing scopes? Hey Dyslexi I just notice that in your recommendations you have V as the GO PRONE, but its default is STEP OVER. . . what gives?? I… don’t use V for step over? Hey dsl, fantastic recommendations that I will be using (and slightly modifying for personal preference). The controls are overwhelming for a beginner. Thank you! I only wonder, instead of changing the left/right scroll to generic buttons in the software, why not just use mouse4+5 on the side of your mouse? I use those buttons for TS and screenshots already. Great articles D. I have been pouring through your video’s and such with my resurrected addiction to ARMA. Been playing since 1, and the AI of 2 got me a little down. Arma 3 is just what the doctor ordered, and your well thought out commentaries that you share with the community is really helping out. I have two monitors but a poor memory. I’d love to be able to put a cheat sheet up on my unused second screen. I’ve built some homely Google Doc spread sheets for ArmA 2 squad commands but wonder if you knew of anything prettier and customizable? Great guide to controls. Could you please detail your Helicopter key-bindings? I have just ordered a TrackIR and pedals and am curious as to your control set-up for flying. I’m guessing you have pitch and roll on the mouse, rudder on pedals and just collective on keyboard. a Quick Question: when you say, “lights”, do you mean the headlights control or one of the optics buttons? Headlights is what it’s called in the binds. Free-aim is great for scattering rounds down-field at groups of enemy soldiers. It keeps the cross-hair bound to an area determined by the amount of spread you expect to see while compensating for recoil and stamina. The result is that you can ‘spray’ very accurately in semi-automatic while compensating some of the random errors. Does anyone know if you can disable the “Shift” and left mouse button to place a mark on the map? Trying to run a bunch of members through land nav and don’t want them cheating. hi dslyecxi, i notice you had a training mission for helis out for public (arma2) you reccon you can make it work under arma3.. and also what controlls do you use to fligh your heli. Im guessing you use keyboard + mouse, but i would love to know your settings =)..
I’ll probably do an A3 training mission once they finalize the flight model. I realize that there is much resistance to those of us who use controllers, but is there any way you could show those of us that do how to best configure it as you do here with the K&M? I cannot get my right trigger (this is common to many of controller players) to bind, and I’m sure you could help us to put the most important keys onto the controller, leaving the less common inputs to the K&M. As always, your advice and input is greatly appreciated. PS – Are there better base setting when using a controller that you might recommend (head bob, dead zone, etc.) I do not have the ability to hold my breath when taking a shot (I’m out of buttons, unless they make a workable preset or you can help me free some up), so I was wondering if that could even up my odds. On most FPS, you can stand, crouch and stand up, all using the right stick, by either holding it down or clicking it, but I have not been able to create that. Thanks for accepting my follow up. Any chance of a table with all the rebinds / key mappings as recommended by you? As you’re a seasoned player, I think many newbies may find your keyboard layout great to use. But hard to implement in the current article. do you always get asked stupid questions or is it just this page? Hi, great setup and cheers for sharing. I was just wondering if you are experiencing the same issue with tactical pace… Since a few patches ago it only works if shift+alt is pressed at the same time… So If I’m walking (holding shift) and I then press alt it doesn’t go into combat pace… same if I hit alt first then shift. You really need to update, because right now there are some changes in the resent update that is not covered in the video. Well, that was all see you in battle some where. I don’t have an adjust key on my controls menu. Can anyone help?